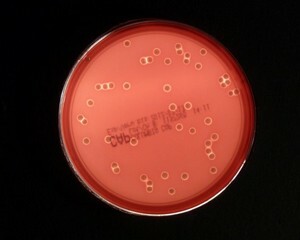 A Beta-hemolytic colonies of Staphylococcus aureus on sheep blood agar. Cultivation 24 hours, aerobic atmosphere, 37°C. 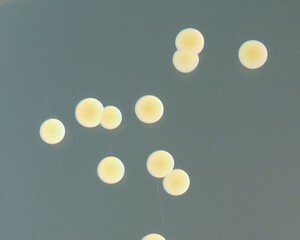 B Yellow colored colonies of Staphylococcus aureus on Tryptic Soy Agar. 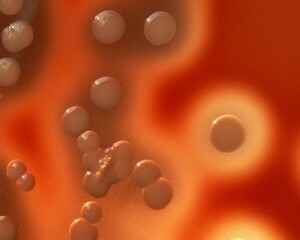 Carotenoid pigment staphyloxanthin is responsible for the characteristic golden colour of S. aureus colonies. This pigment acts as a virulence factor. Cultivation 24 hours in an aerobic atmosphere, 37°C. 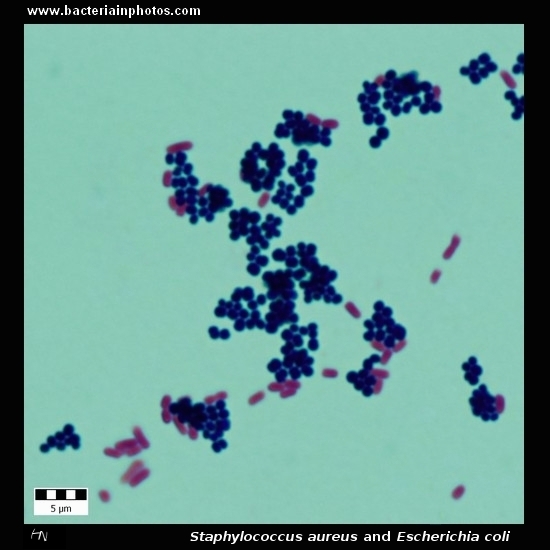 C Colonies of Staphylococcus aureus seen with transmitted light. Cultivated on Columbia agar with 5% defibrinated sheep blood, 24 hours in an aerobic atmosphere, 37°C. Colonies are surroundend by a wide zone of beta-hemolysis.